We need to make repair accessible to everyone. That means repair documentation needs to go with people to where the broken things are. Computers aren’t very good at the whole mobility thing—but the iPad sure is! iFixit is now native on the iPad, and live in the app store. Just like all of our repair manuals, it’s free and has no ads. The iPad is an impressively rugged device. I expected that we would be inundated with tales of cracked screens the moment Apple started shipping them—but it hasn’t happened. That’s not because people aren’t dropping them, but because the well-engineered aluminum frame combined with thicker-than-iPhone Gorilla glass are incredibly robust. The moment the iPad came out, I knew it was the perfect repair platform. 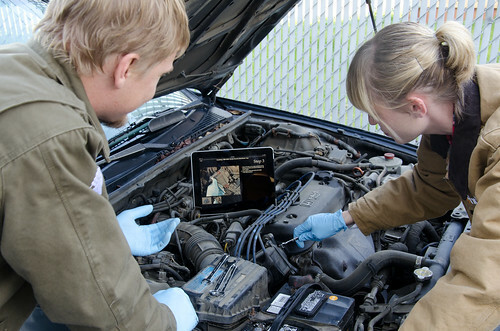 Imagine having every repair manual ever written on your tablet—completely accessible while you’re working underneath your car! 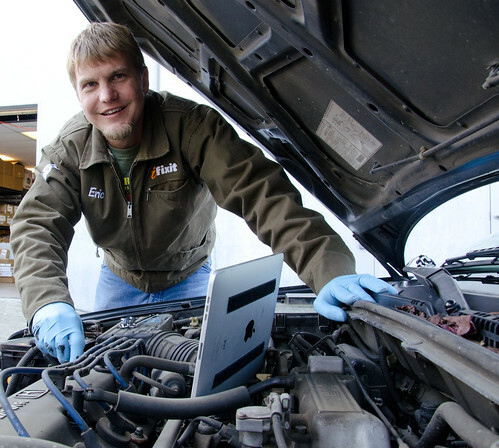 The iPad is no bigger than one of my Chilton repair manuals—and it’s just as mobile. The battery can handle a full day out working in the shop. It’s incredibly durable (doubly so if you have a rugged case). And it’s always connected, so I know I’ve got the most up-to-date instructions. Phenomenal! I think mobile repair could be a killer app for the iPad. I could see buying an iPad just for fixing things. Unlike the repair manuals of yore, iFixit on iPad gets better when you’re not using it—because thousands of people all over the world are constantly editing and making our manuals better. I am ecstatic—this is the sort of innovation I envisioned when we started iFixit. We are taking repair to the people, and empowering individuals one step at a time. We’ve been working on this for quite a while, but we couldn’t release it until we finalized our public API—which the app is built on top of. We finally submitted the app on November 30, and after some back and forth with Apple, just barely managed to get it approved before Apple’s app team takes a well-deserved week off for Christmas. This app was in the very last batch of apps they approved before they left for the holiday. Now that’s what I call just in the nick of time! Right now, the app blends a native, full-screen guide view with web views for navigating the site. We kept the app focused on performing repairs, so we don’t have native support for much of iFixit—including Answers and guide editing. You can still do just about everything in the app’s web view that you can on a computer, and I think it works quite nicely. Over time we’ll learn what works well on iPad and how people are using it. We’ve been using the app around the office to fix things over the last couple weeks, and I can definitively say that our native iPad view is the best way to repair anything. Period. Performing a repair with the app is a phenomenal experience. It really feels like the future. Follow a step. Swipe to the next step. Tap to zoom in on a photo, and pinch to zoom to see the itty-bitty details of an individual screw head. Tap to close, swipe for the next step. The iPad completely disappears, and the photo manual is all that you experience. This really is a quantum leap forward in making online knowledge seamlessly useful. As I said when we announced the API last week, the sky is the limit on innovating around our repair database. This app is a great example, and learning how we did it could be really useful to help you get going on your own repair apps. So we’ve open sourced our iPad app! It’s freely licensed under the GPL (and also the CDDL, for esoteric legal reasons explained here). The source is up now on Github. We built this app using our API— It currently uses the /api/guide, /api/areas, and /api/guide/featured endpoints, but it will use more of the API in the future as we add more functionality. We have lots of ideas for improving the app—storing guides locally so you can follow them offline, adding commenting, and integrating more interactive features so you can share what repairs you’ve completed. But we’ve got a small development team, and we just don’t have time to do everything. So if you want to pitch in and add your own code to the app, we’d love your help. ...And then follow our step-by-step instructions to fix your device! Previous Post What if you had a DVD with every iFixit guide? fantastic app, but what about us with our I-phones and I-pads??? Sorry I mean’t, Fantastic app. but what about us with our I-pods and I-phones??? Brilliant. I already used the online guide in Safari on the iPad to replace the hard drive on my MacBook Pro and really appreciate having clear instructions and good photographs to guide me through the process right beside the job I’m working on. This app will make that kind of job even easier and the idea of a ‘repair everything’ manual really hits the spot. I’m looking forward to seeing what’s in the app as I’ve just downloaded it on my MacBook Pro but am going out to sign in Christmas, so don’t have time to check it out on the iPad till Christmas Day. Please please please, port this to the iPhone/iPod touch! Don’t just relegate us users that don’t have an iPad from this awesome app. Would love to see the app but don’t have iPad! Please port to iPod/iPhone!! Thanks! I don’t know that the iPad’s glass is as durable/robust as some people think. I accidentally dropped my iPad screen-side down recently on a flat concrete floor with tiny stones here and there carried from people walking in and out and one of the stones created a chip-sized crack in the front glass. The thing didn’t shatter, but this visually annoying crack is evidence that although it’s tougher, it’s not invulnerable. I wish there was a glass chip repair for the iPad/iPod touch/iPhone like they do windshields, then there would be no need to replace the whole $150 front panel, only patch up the chip in the glass.